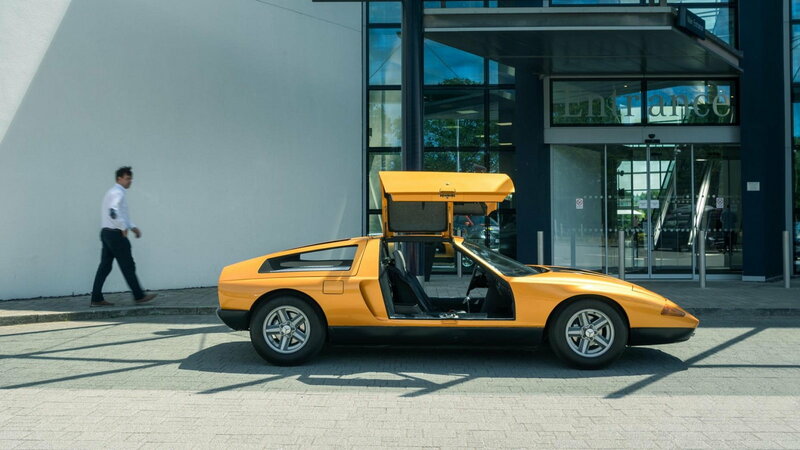 The ultra cool Mercedes C111 was used as a testbed for various design concepts by the German manufacturer over the course of a decade and once again saw the light of day at the 2017 International Motor Show in Frankfurt Germany. In the mid-1960's Mercedes began brainstorming ideas to potentially build a mid-engined sports car that would be placed above the SL series in their model lineup. After scrapping the idea of this SLX coupe concept (which actually made it to the rolling model stage without an engine) a small team of designers and engineers were designated to build an experimental car that could be used to test new automotive ideas and technology. Work began on the C101 Mercedes in 1967 and debuted at the 1969 Frankfurt Motor Show, although it was renamed the C111 because the model name supposedly infringed upon a name trademarked by Peugeot. 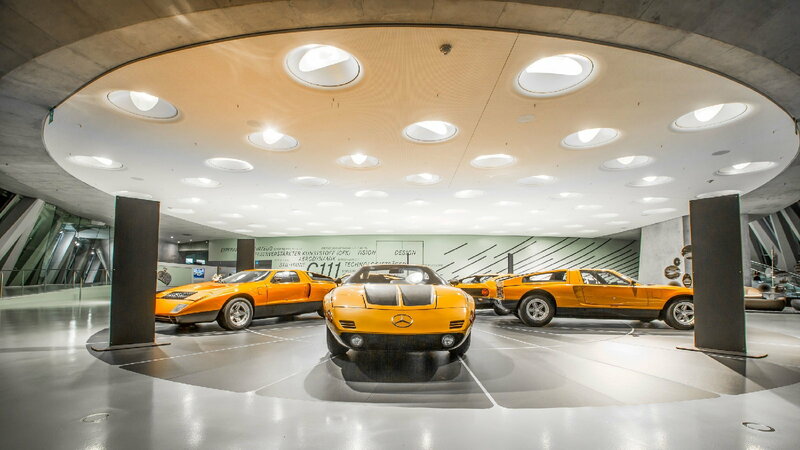 >>Join the conversation about the C111 Concept car right here in MBWorld. By most accounts, the C111 left visitors of the showcase in amazement and was the talking point of the entire car show. 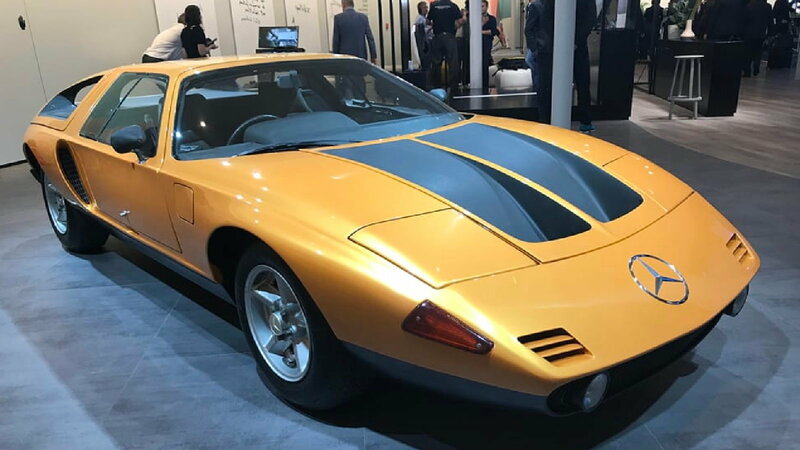 The car definitely turned heads with its gullwing doors, pop-up headlights, mid-mounted engine, low roofline, various exterior vents, and a fiberglass body painted with a bright orange finish. Mercedes had been experimenting with Wankel rotary engines since 1961, so naturally, a 3-rotor Wankel displacing 600cc per rotor chamber was used. The engine used direct injection to help produce 280 horsepower that, when coupled with the ZF 5-speed transaxle, propelled the car from 0-60 mph in 5 seconds flat with a top speed of 161 mph. While the car was stunning to look at and had great performance numbers, there were various new ideas at work on the C111 not easily seen by onlookers. The car used fuel tanks in its deep door sills surrounding the cockpit to carry 31 gallons of fuel and further reduce the center of gravity. Airflow was at the forefront of development with large rear scoops for the oil coolers and venting in the front hood to pull heat from the radiators. Other experimental ideas included the zero offset steering and front suspension system, flush mount glass for reduced drag, and a glass-fiber-reinforced-resin composite body construction. Upon initial testing, the car was able to achieve 0.9G in cornering which was unmatched by other road cars of the time. Development was an ongoing process on the C111. Only months after its debut at the '69 Frankfurt show, the car turned up at the 1970 Geneva Auto Show with multiple changes. Several visual improvements were made including dual extractor vents in the hood, larger flying buttresses linking the roof to the rear fenders, a bigger windshield, and exterior mounted fog lights. 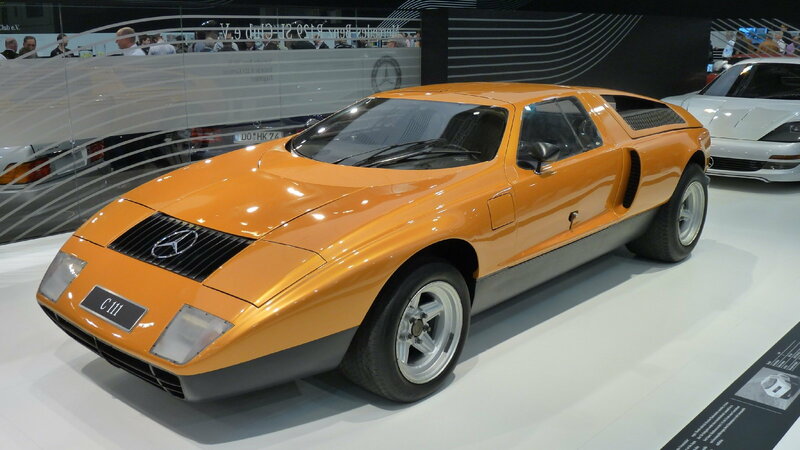 The biggest change to the C111-II was a pumped-up 4-rotor Wankel engine producing a stout 350 horsepower. Although the car improved its 0-60 sprints to 4.8 seconds and could reach a top speed of 186 mph, Mercedes engineers determined that the Wankel engine design used excessive fuel that resulted in extremely high emissions and poor fuel economy, thus making it an impractical engine choice for a road-going vehicle. With stricter fuel standards hitting the US in the early 1970's, Mercedes switched gears to focus on improving their diesel powerplants. 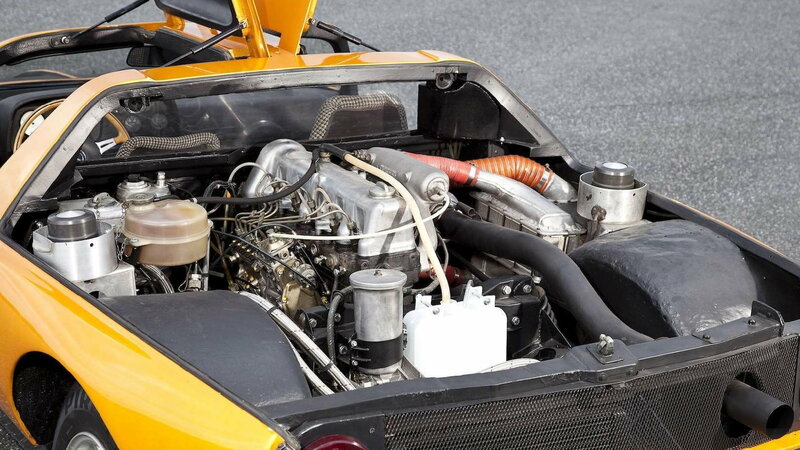 Surprisingly, engineers turned to their 3.0L inline-five cylinder diesel as used in the w115 sedans to power an all-new C111 coined the C111-II D. The original engine was naturally aspirated and produced a mere 80 horsepower, but the C111 team modified the engine with a turbocharger and intercooler setup to boost its output to a respectable 190 horsepower. While some may have been skeptical of this oil burner, 1976 saw the team take the car to the Nardo test track in Italy where the car set numerous world speed records including an average speed of 156 mph. 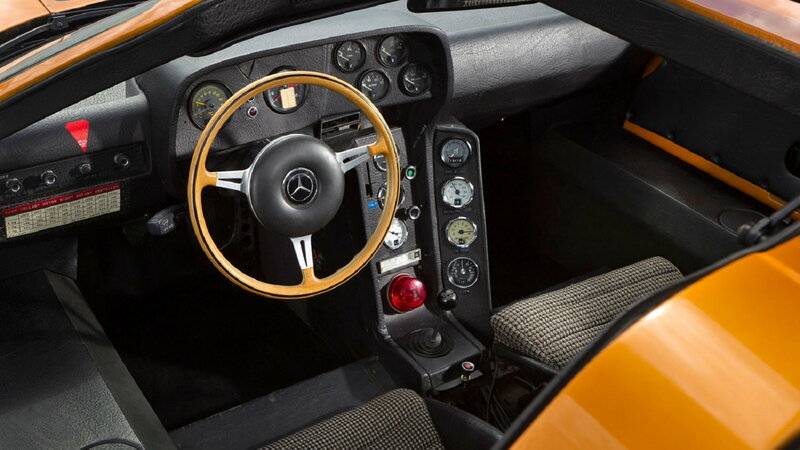 With continual aerodynamic development and diesel engine improvements in the C111-III boosting horsepower output to 230bhp, the test mule would eventually hit the 200 mph mark in 1978 and set an additional 9 Nardo circuit speed records. The last hurrah of the C111 came in May of 1979 with the C111-VI. In order to beat the outright Nardo circuit world record of 355.854 km/h held by a 1,000 horsepower Can-Am race car, the Mercedes team modified the C111 into a full aerodynamic race trim including two fins and additional spoilers for increased downforce. Additionally, the team felt the diesel engine was at its limit, so they modified their production gasoline 4.5L V8 engine into 4.8L powerplant featuring sodium-filled valves, twin KKK turbochargers, and a triple-plate clutch. All said and done the engine made 500 horsepower & 442 lb-ft of torque and propelled the car to a circuit record of 403.937 km/h (251 mph). 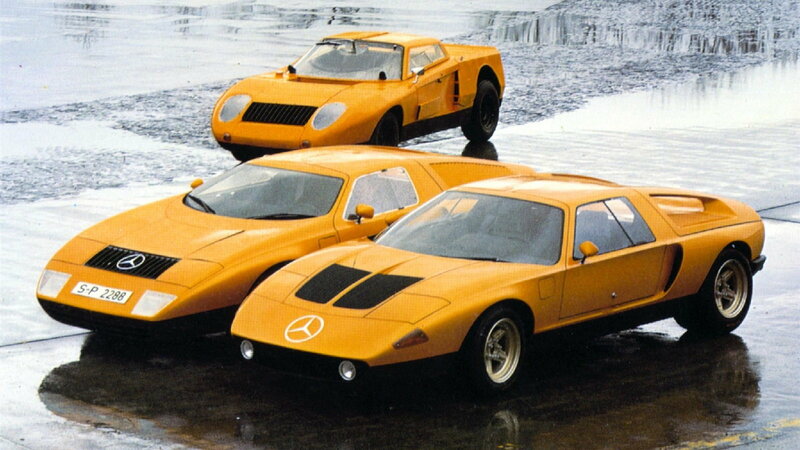 If Mercedes had decided to sell any version of their C111 mid-engined coupe it would have undoubtedly changed the course of supercar history. Even though the cars were never sold to the public, they still made a huge impact on both design and engineering fronts that are still used today. For these reasons alone, it is only fitting that the C111-II in all of its glory was on display at the 2017 Frankfurt Motor Show. Although it may not have experienced the glitz and glam of some of the new vehicles featured at the show, enthusiasts were able to experience first hand a piece of history that has significantly influenced the course of the modern automotive world.